From HuffPo/Reuters: "A Taliban suicide bomb and gun assault on a government security building during Tuesday morning rush hour in central Kabul killed at least 28 people and wounded more than 320, in the most deadly single attack in the Afghan capital since 2011." exact time unknown -- "morning rush hour"
1. Pallas novile Pluto; Pluto square Uranus and parallel/semisextile Saturn (rulers of Pallas). 2. Venus ruled by Mars which is square Neptune. 4. 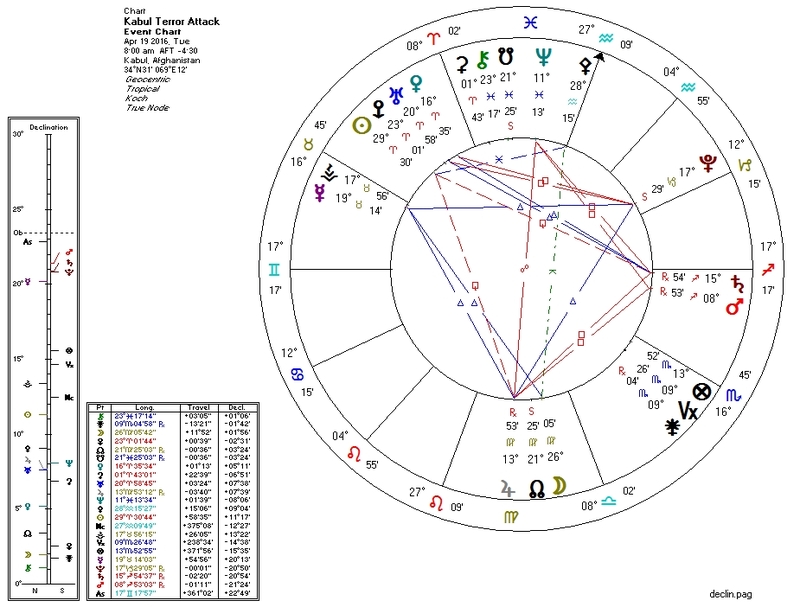 Pluto trine Mercury, ruler of Moon. 5. Sun ruled by Mars which is parallel Pluto. This expression of the formula is relatively weak -- no concurrent reports of major violence elsewhere.